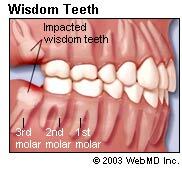 Wisdom teeth are the third set of molars that generally erupt between ages 17-25, when children pass into early adulthood. This time period has previously been referred to as “the age of wisdom.” Subsequently, the third molars have been dubbed wisdom teeth. Most people have 4, but it is possible to have more as well as none. Sometimes, a patient has room enough to keep 1, 2, or four of the teeth. A panoramic x-ray will allow the dentist to see if there is room enough for you to keep some or all of them. Third molars need to be extracted when the mouth and jaw are too small to accommodate the teeth, or they are unable to fully erupt. These situations can cause discomfort, swelling and sometimes even cysts. Where do wisdom teeth come from? 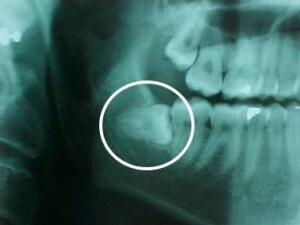 Wisdom teeth were originally designed to take the place of lost or damaged teeth that resulted from a primitive diet of coarse food that contained sand and grit. Now days, processed diets protect teeth, meaning less are lost and damaged. There is usually not enough room for the teeth to come all the way in. Will I need to be put to sleep? Some patients prefer to be sedated while others are just fine with a local anesthetic such as Novocaine. Either way extractions can be done right here in our office where you already know the staff and dentist. Most patients do fine to head back to work or school the next day, but if you want to take an extra day off, we won’t tell. So if you have been putting off the removal of your third molars, there is nothing to fear! Dentistry has come a long way from the covered wagon and whiskey days of our parents! We have a variety of solutions for patients apprehensive about extractions and the skill to make your experience the most comfortable possible.